This home office unit features a writing desk, writing desk hutch, computer credenza and corner filler. 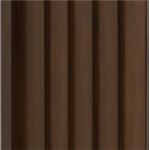 Each piece is constructed from hardwood solids and poplar veneers. This writing desk features English dovetail drawer construction, metal drawer glides, flip down keyboard tray and removable pencil storage compartment. The computer credenza features English and French dovetail construction, metal drawer glides and satin nickel bar pull hardware. 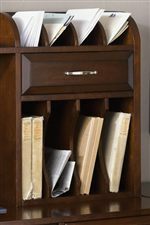 The writing desk hutch features vertical storage compartmetns, punch board back and 1 storage drawer. This L-shaped desk will create a functional and a convenient work space for your home office or den. The Hampton Bay 4 Piece L-Shaped Desk by Liberty Furniture from Bullard Furniture. We proudly serve the Fayetteville, NC area. Product availability may vary. Contact us for the most current availability on this product.